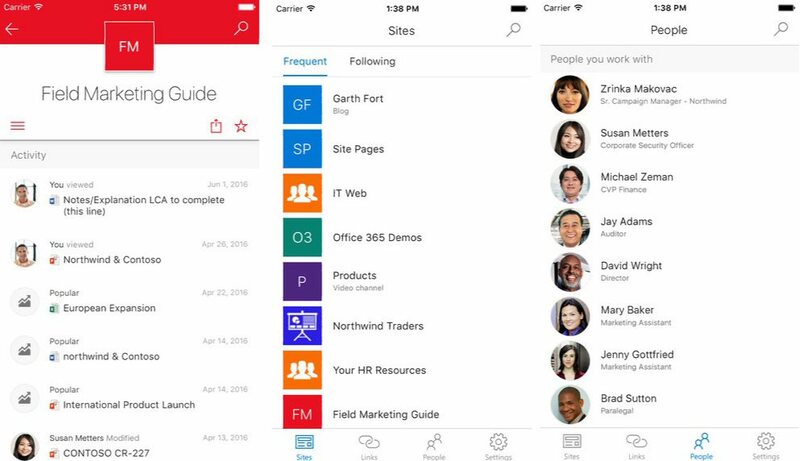 Microsoft SharePoint app is now available on iOS. Microsoft SharePoint app for iOS is free but to sign-in, your organization needs to have an Office 365 subscription that includes SharePoint Online, or an on-premises SharePoint Server. Now you have the intranet in your pocket with the Microsoft SharePoint app for iOS. Sign-in to your SharePoint sites: Whether they’re in the cloud or on-premises. The app works with SharePoint Online, and SharePoint Server versions 2013 and 2016. You can add multiple accounts, and easily switch between them. Quickly find your sites: Check out the Sites tab, to see the sites you frequently visit and the sites you follow. Tap on a team site to dive into it. See site activity, navigate using the familiar quick launch navigation, easily follow or share the site, and work with your lists. Check out recent and popular files: In a team site, get to your recent or popular files quickly to view or share them, and have full access to your document libraries using the new integration with the OneDrive app. Edit your files easily using Office Mobile apps like Word, Excel, PowerPoint, and OneNote. Use the Links tab to find promoted links for your organization: Curated by your SharePoint admin for all employees, these links get you to the organizational resources and sites that you care about. Search: Enterprise Search is available throughout the app and results are organized into sites, files and people. Find and browse for people you work with: Tap on a user to get to their contact card and to see who they work with and what they are working on.